Courtesy VERITAS The VERITAS array in Amado, Arizona. 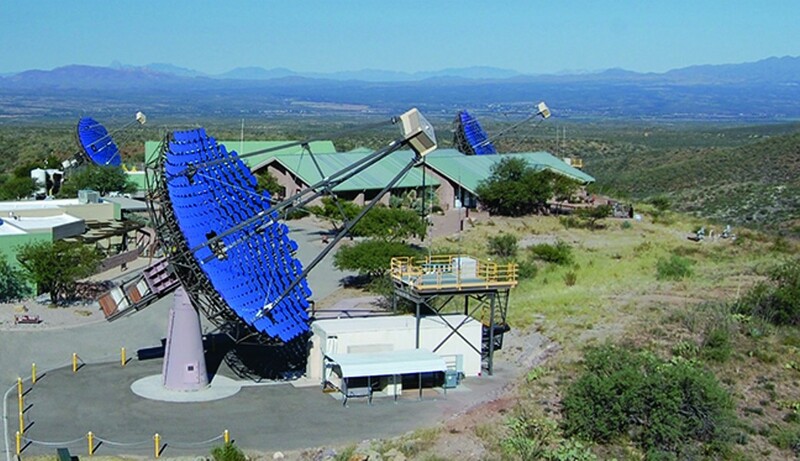 Just south of Tucson, a group of astrophysicists need the public's help researching the most energetic radiation in the universe. Scientists at the VERITAS observatory array in Amado, Arizona are launching their second "citizen scientist" mission after a successful first project in 2017. Titled "Muon Hunters 2: Return of the Ring," the project tasks public volunteers with distinguishing between astral phenomena in telescope images, all from their own computer. "We had a very successful first run," said Michael Daniel, operations manager at VERITAS and project lead for Muon Hunters, "We take something like three to four million images every 30 minutes, so we simply can't afford to sort through them all." Scientists use the VERITAS telescope array to study gamma rays and explore extreme processes in space like black holes. The goal for Muon Hunters 2 is differentiating between gamma rays and muons, which are particles like electrons, but heavier. "At VERITAS, we're searching for gamma rays, which have the shortest wavelengths and the highest energy of any portion of the electromagnetic spectrum," Daniel said. "Muons are background that we have to get rid of so that we can more easily identify gamma rays." The Muon Hunters project presents citizen scientists with telescope images, and asks them to differentiate the shapes between muons and gamma rays, something computers have a difficult time doing. Muons produce distinctive ring-shaped images in VERITAS's cameras, while gamma rays come in the form of ellipses. But if the telescope only captures part of a muon, it may appear more as an ellipse, and confuse the computers. "It's not the simple thing of saying this is a circle and this is not," Daniel said. "It's the difficult thing of identifying parts of a circle partially on a camera. The human brain is very good at recognizing objects." New to Muon Hunters 2 is how the information will be presented to participants, and how human information will help teach the computers. The images will be presented in a grid pattern, rather than one-by-one for more efficiency. "This time around, we're trying to make both the project and the telescopes more efficient," said Lucy Fortson, University of Minnesota Astronomy Professor and VERITAS researcher. "Scientists will use the images that citizen scientists have identified to better train their computer programs to automatically tell the difference between muons and gamma rays." Despite this being complex scientific research, Daniel is not concerned about the accuracy of the general public. "It really is surprisingly accurate," Daniel said. "But when you sit down and think about it, it's not that surprising because you're harnessing the power of statistics." Every muon or gamma ray image must be examined 10 times by 10 different participants for added accountability and accuracy. The scientists at VERITAS, which includes the Fred Lawrence Whipple Observatory, consider the original Muon Hunters project a great success. The project saw over 6,000 citizen scientists who made 2,161,338 classifications of 135,000 objects. As of now, Muon Hunters 2 has 1,400 volunteers. Scientists are hoping to beat the number of participants from the original project. "There were a few very dedicated participants who identified over 10,000 images each," Daniel said. "Some of our participants are disabled, so working from home is useful for them... The nice thing is that demographics were peaked toward younger people." Researchers also found the population of citizen scientists was fairly balanced between men and women. And although there were more young participants, some of citizen scientists were over 65 years old. "One of the best parts is that you don't have to be a scientist to participate," said Amy Oliver, public affairs officer for the Harvard & Smithsonian Center for Astrophysics. "Muon Hunters 2: The Return of the Ring," is run by Zooniverse, the largest online platform for collaborative volunteer research. The citizen science projects at Zooniverse aid researchers in efficiently combing through large amounts of data by utilizing the efforts of millions of volunteers from around the world. "I think people join because humans are inherently curious," Daniel said. "All it takes is a bit of curiosity." To join the project and become a citizen scientist, visit muonhunters.org.